Pairs of eyeglass frames and a sign on the Afghan flag, which reads “Do Not Eliminate Us!”. Shared via Republic of Silence Facebook page. 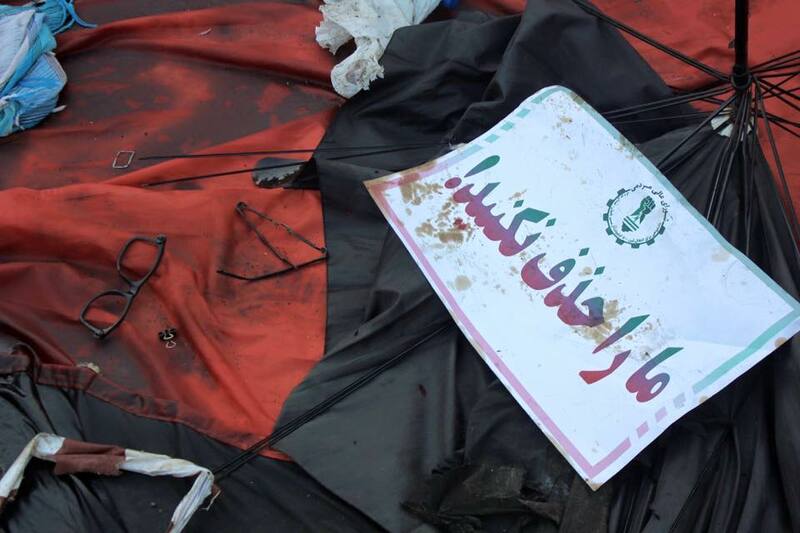 Nearly 90 people were killed and hundreds injured after two suicide bombers struck a peaceful protest led by the Hazara Shi'ite minority group in Deh Mazang, Kabul on July 23, 2016. The attack, one of the deadliest since 2001, was later claimed by the ISIS. Afghanistan's minority group, the Hazaras, were marching to protest the Afghan government's plans to re-route a major power project, the 500 kV power transmission line from Turkmenistan to Kabul, which was originally planned to go through Bamiyan, a predominantly Hazara province. One Global Voices author, Bismella Alizada, was briefly hospitalized following the blasts, and other authors from the GV community had family members directly affected by the savage attack. The Hazaras had carried out similar protests in May, launching the so-called Enlightenment Movement which had pushed President Ghani to issue a decree to build a smaller electricity line through Bamiyan. However, that concession alone was not acceptable to many Hazaras. President Ghani established a committee to investigate the twin attacks. He declared the next day of the attack a day of national mourning and named Deh Mazang ‘Martyrs Square’. Yet following the attack, Afghanistan's Interior Ministry issued a 10-day ban on public gatherings citing a heightened risk of sectarian violence. Hazaras have been historically persecuted and discriminated against. The Deh Mazang attack is the worst recent attack on Hazaras since 2011 when twin blasts in Kabul and Mazar-i Sharif killed around 80 people who had gathered to commemorate Ashura, which marks the death of Shi'ite Islam’s holiest martyr. Since the collapse of the Taliban regime, abductions, extortions, and violent killings of Hazaras have remained a concern, and sparked protests and demands for better protection of the minority group. Several Hazara political and intellectual figures blame Ghani's government and are concerned that it is not able to protect Hazaras anymore. Some Hazaras believed that the attack on July 23 might have been encouraged by people from inside the government. Bilal Sarwary, an Afghan journalist, tweeted that Afghan government knew about the attack. Ever since the attack, Hazaras have stormed social media in search of justice, writing about and posting pictures from the protest as well as sometimes graphic images of the aftermath of the attack and its victims. Hazaras from all over the world showed solidarity through various gatherings and on social media with the victims of the protest and the enlightenment movement. Afghanistan observed a national day of mourning on July 24. Families of the victims collected bodies from hospitals and morgues to prepare for funerals. Many families are still searching for their missing relatives and friends. Hikmatullah Shafaiee was one of the protestors who was killed in the attack. Basir Ahang quoted the mother of a victim, who encouraged people to continue fighting for their rights. Kabul Relief Effort, a Facebook page that coordinates all the relief efforts for the victims of the attacks, recently posted names of two other victims of the attack, Abdullah Frotan and Qurban, who lost their lives in the NATO Hospital. Fatima Ghulami, a women's rights activist from Bamiyan, posted a photo of a woman crying for losing a loved one while photos of the victims hang on the walls. Families were painfully searching for the bodies of their loved ones at Kabul hospitals. 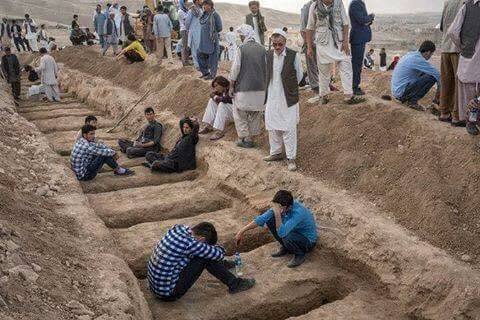 The bodies of those who were killed were buried in western Kabul or taken to their home provinces. The graves of those who were killed in the attack at Deh Mazang on July 23, 2016. Shared via Hazara International Network Facebook page. These are only a few faces of the victims of Deh Mazang attack. The death toll and number of injuries from the blast is still being updated as of August 7.